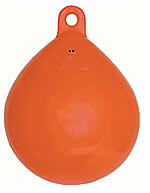 Orange PVC teardrop style inflatable buoys with heavy duty black reinforced eye. They can be used as net floats, marker buoys or as fenders on larger boats. Bright orange with back reinforced end. 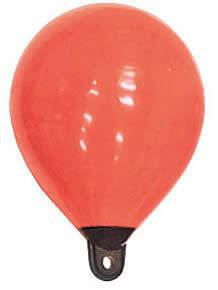 Bright orange inflatable floats made from UV resistant PVC. Complete with a solid eye and a brass inflation valve. Ideal as a general purpose float or marker buoy or for marking ski lanes, rowing lanes etc. Other colours are available to indent order. 3 sizes. Foam filling (where provided) is closed cell polyurethane foam which will allow the buoy to float even if the outer skin is damaged. They are available in yellow colour for standard pleasure boat moorings or red colour on larger buoys, which signifies a commercial vessels mooring. 150mm (6") round with lug. 200mm (8") with lug and handle. Extra large heavy duty foam filled mooring buoy. Has a central hole through the buoy. Max width : 508mm -20"
Height : 610mm - 24"